There is a game called Labyrinth that consists of a square box with a platform inside. On the platform is a maze punctuated by little holes. The object is to move a ball from one end of the maze to the other without letting it fall into one of the holes. Knobs on the outside let you guide the ball by rotating the platform in any direction. A simple game, but difficult in practice! The slightest miscalculation, and the ball goes down. If you lean the platform too far in one direction, you lose control. If you try to compensate, you lose control in the other direction. The only strategy that works is a patient shepherding of the ball along the path as you maintain a balance of movement and force in all directions. I see in Labyrinth a metaphor for our navigation along the pathway of life. We travel from birth to death negotiating around the "holes" by continually balancing our approaches. We maintain steady progress forward by making countless life adjustments -first here, then there. Our actions offset each other in a dance that is sometimes delightful, often challenging. The key is always balance. To achieve balance, we must know how to express all the energies available to us. Personal balance is never static. It comes from the ability to choose dynamically the option that will work in any given moment. 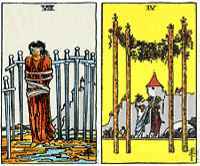 A tarot reading is a map of all the counterbalancing tendencies that are or could be operating in your life at one time. To read this map, you must understand the Law of Opposition - that any quality, once identified, implies its opposite. This is a basic principle of the material universe. The Fool discovers this principle at the very beginning of his journey when he meets the Magician and the High Priestess. These two show him that nothing can be defined in isolation, only as one pole of a balancing pair. At the deepest level, opposition does not exist. There is just Oneness, but, in physical life, we perceive Oneness as broken up into countless different energies. These are the forces we navigate in our search for balance. One way to discover your balance issues is by looking for two cards in a reading that oppose each other. One meaning of the Eight of Swords is restriction - being trapped in an oppressive or limiting situation. If you ponder this meaning for awhile, you realize that simply by acknowledging the idea of restriction, you imply the opposing idea of freedom - the breaking out of bonds and limitations. This quality is represented by the Four of Wands. In a reading, these two cards could be showing you the importance of the restriction/freedom issue in your life. They define the extreme ends of a continuum of experience from which you choose the best balance point for yourself. There are three types of card pairs. Certain cards form clear and obvious permanent opposites. The Eight of Swords and Four of Wands are this type of pair. 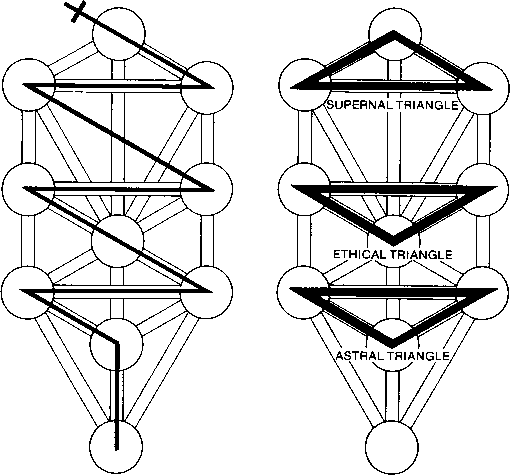 The Magician and the High Priestess are another. 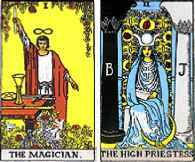 The Magician represents action and conscious awareness; the High Priestess, nonaction and unconscious awareness. You can create a pair between any two court cards or two Aces. These pairs reflect the balance patterns that emerge when you contrast two suits or ranks. The King of Pentacles acts outwardly (King) in an enterprising, adept way based on his interest in the material world (Pentacles). The Queen of Cups has an inner focus (Queen) that is emotional and intuitive based on her concern with feelings (Cups). In a reading, this pair could represent a conflict between two people - a can-do type who wants to get the job done, and a dreamer who first wants to see how everyone feels. This pair could also represent a dual approach within you - perhaps a need to focus on worldly concerns vs. a desire to concentrate on the spiritual. There are many possibilities, all based on the dynamic between these two styles. Check the court card and suit pair charts for some ideas on how the suits and ranks interact.